It's the most powerful Panamera ever. 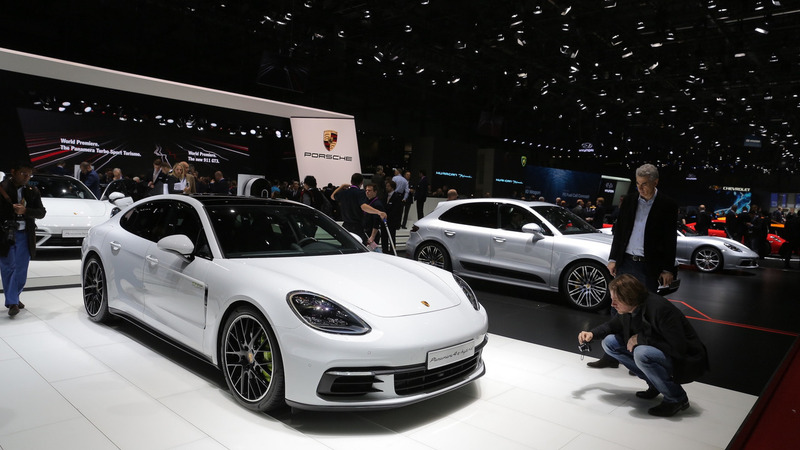 Porsche introduced the second-generation Panamera last year at the Paris Motor Show where one of the models on display was the 4 E-Hybrid. Combining a biturbo 2.9-liter V6 with an electric motor enabled the electrified sedan to develop 462 horsepower (340 kilowatts) and 517 pound-feet (700 Newton-meters). Now, the peeps from Stuttgart are launching a “Turbo S E-Hybrid ” version that comes along with a beefy 4.0-liter V8 engine replacing the six-cylinder unit. With the combustion engine pushing out 550 hp (404 kilowatts) and the electric motor generating 136 hp (100 kW), you’re looking at the most powerful Panamera model Porsche has ever made. It has a massive combined output of 680 hp (500 kW) and a mountain-moving torque of 627 lb-ft (850 Nm). The engineers have adapted the boost strategy from the sold-out 918 Spyder supercar when developing the new range topper in the Panamera family. Speaking of supercars, the Panamera Turbo S E-Hybrid has the performance numbers to go up against some of the fastest cars in the world, while seating four people in utmost comfort and their luggage. It runs to 62 mph (100 kph) in only 3.4 seconds, thus making it 1.2s quicker than the aforementioned 4 E-Hybrid. Go all out and the hybridized super sedan will reach an impressive top speed of 192 mph (310 kph) whereas the non-S model can “only” do 173 mph (278 kph). Both E-Hybrid models have enough battery juice from the 14.1-kWh pack for an electric range of as much as 31 miles (50 kilometers) and share a decoupler installed in the hybrid module, which is actuated electromechanically by an electric clutch actuator. Another piece of hardware the two have in common would have to be the eight-speed, dual-clutch automatic transmission in charge of sending the power to both axles. As it’s the case with the regular E-Hybrid, the hotter S model will be available with a standard wheelbase and with a stretched one for the more expensive Executive model adding 150 mm (almost 6 inches) between the two axles to grant superior rear legroom. As standard, the new arrival in the growing Panamera family benefits from an air suspension, ceramic brakes, 21-inch wheels, Porsche Dynamic Chassis Control Sport, torque vectoring, and auxiliary air conditioning. Go for the long-wheelbase model and you’ll also get rear-wheel steering. The Panamera Turbo S E-Hybrid will celebrate its world premiere next month at the Geneva Motor Show where it will sit alongside the Panamera Sport Turismo wagon. Pricing details are already available for the U.S. market where the standard-wheelbase model will kick off at $184,400 while the Executive model will begin from $194,800, with both prices excluding the $1,050 delivery, processing and handling fee. 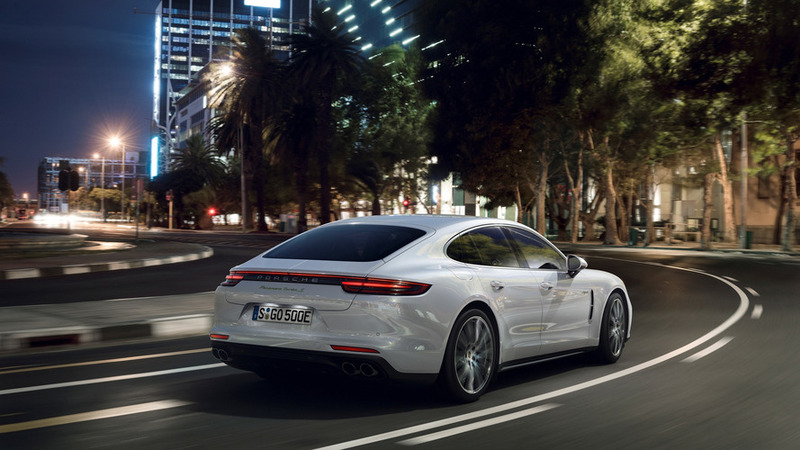 The four-litre V8 engine from the Panamera Turbo is combined with an electric motor, resulting in 500 kW/680 hp (Combined fuel consumption 2.9 l/100 km; electric energy consumption 16.2 kWh/100 km; CO2 emissions 66 g/km) of system power and outstanding power delivery: Even when just above idle speed, the Panamera Turbo offers an 850 Nm of torque. That means it accelerates from zero to 100 km/h in 3.4 seconds and reaches a top speed of 310 km/h. The boost strategy of the all-wheel drive Panamera comes from the 918 Spyder super sportscar. 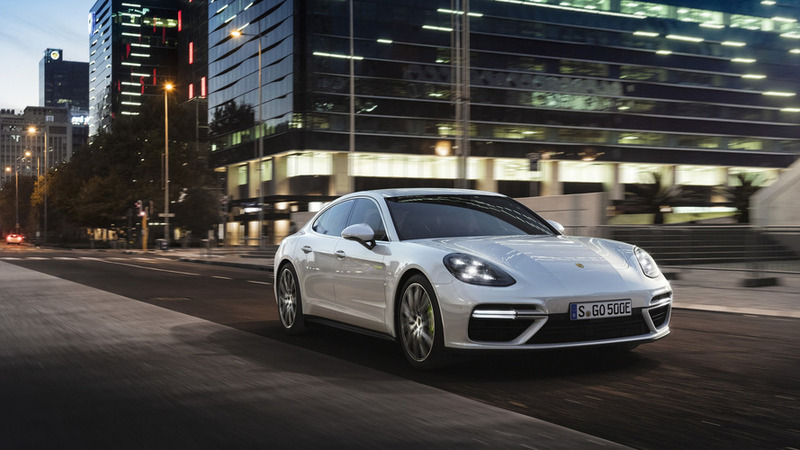 In the New European Driving Cycle, the average fuel consumption is 2.9 l/100 km, and the new flagship Panamera can drive on fully electric power for up to 50 kilometres. The Panamera Turbo S E-Hybrid underlines the high importance of electromobility to Porsche. 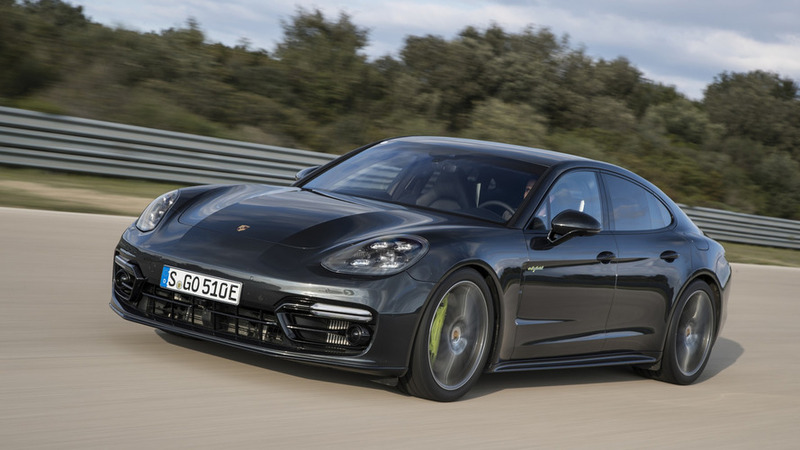 After the successful début of the Panamera 4 E-Hybrid, which uses a V6 engine together with an electric motor, Porsche is showing once again that hybrid technology has great performance potential. The new Panamera Turbo S E-Hybrid combines an electric motor (100 kW/136 hp) with a V8 engine (404 kW/550 hp). The decoupler installed in the Porsche hybrid module is actuated electromechanically by an electric clutch actuator (ECA), just like in the Panamera 4 E-Hybrid. The result is short response times and a high level of comfort. As in all other second-generation Panamera models, the fast-shifting Porsche Doppelkupplung (PDK) with eight gears is used to transmit the power to the standard adaptive all-wheel drive system Porsche Traction Management (PTM). The E-Performance drive accelerates the luxury saloon to 100 km/h in just 3.4 seconds and provides extraordinary tractive force at higher speeds. Combined with a top speed of 310 km/h, this means that the Porsche Panamera Turbo S E-Hybrid sets yet more new benchmarks in its class. The Panamera Turbo S E-Hybrid comes with air suspension as standard and offers a unique balance in this segment: the comfort of a luxury saloon paired with sportscar-level performance values. The electric motor is supplied with power via a liquid-cooled lithium-ion battery with an energy capacity of 14.1 kWh. Within six hours, the high-voltage battery integrated in the rear is fully charged with 10 A via a 230-V connection. If the Panamera uses the optional 7.2-kW on-board charger and a 230-V connection with 32 A instead of the standard 3.6-kW charger, the battery is fully charged in just 2.4 hours. The charging process can also be started using a timer via Porsche Communication Management (PCM) or the Porsche Connect app (for smartphones and Apple Watch). Moreover, the Panamera Turbo S E-Hybrid is fitted with auxiliary air conditioning to cool or heat the passenger compartment even during charging. Performance, comfort and efficiency form a perfect three-way combination: The Panamera Turbo S E-Hybrid starts in the purely electric “E-Power” mode as standard, and the four-door sportscar drives locally over a distance of up to 50 kilometres with zero emissions. 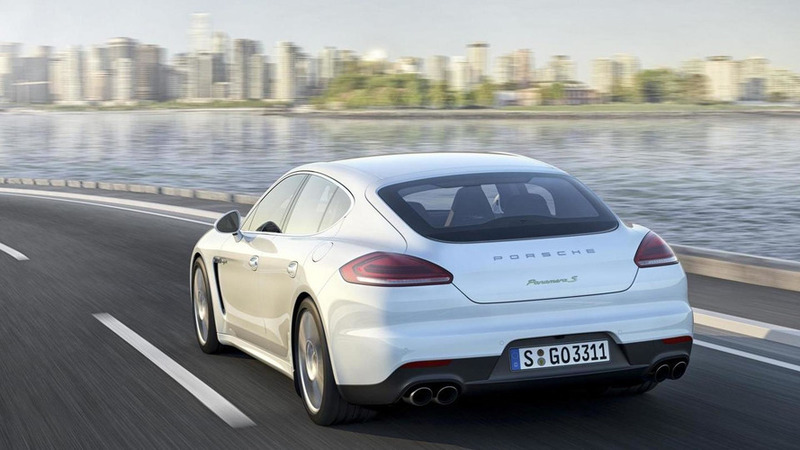 When a specific pressure point is passed in the accelerator pedal, or when the battery charge level drops below a minimum value, the Panamera switches to “Hybrid Auto” mode, at which point the power of both engines is available. Consumption in the New European Driving Cycle (NEDC) for plug-in hybrid models amounts to 2.9 l/100 km for super-grade petrol (66 g/km of CO2) and 16.2 kW/h/100 km for electric power. The new flagship of the second Panamera generation will be launched in the European market in July 2017. Further markets will follow in the second half of 2017. The Panamera Turbo S E-Hybrid is celebrating its world première at the Geneva Motor Show (March 7 to 19, 2017). From the very beginning, the four-door Gran Turismo will also be offered in an Executive version, with a wheelbase extended by 150 millimetres. As part of its standard equipment, the Panamera Turbo S E-Hybrid includes the Porsche Ceramic Composite Brake (PCCB), Porsche Dynamic Chassis Control Sport (PDCC Sport) including Porsche Torque Vectoring Plus (PTV Plus), Power Steering Plus and 21-inch alloy wheels in the 911 Turbo Design. The basic package also contains auxiliary air-conditioning, adaptive aerodynamic elements and three-chamber air suspension including Porsche Active Suspension Management (PASM). The long version is equipped with rear axle steering as standard.